Lock in a great price for Smilen Hotel and Wellness – rated 9.1 by recent guests! Spacious room, view over frozen lake, nice bathroom, warm room. The staff was exceptional in terms of quality and personal touch. Rooms with fire place was extremely cozy. Great location with a great view. the lady at the front desk was very welcoming and helpful. We took the apartment with two bedrooms and it was very comfortable and clean. Breakfast was tasty. Due to sensitivity to food, we asked for a lactose-free meal for my son and they prepared something especially for him. The place was great! Good location! Staff was friendly! Room was big and cozy, fireplace with real wood was nice touch! I really like the calmness this place gave me. It has its own coziness and charm. Definitely will go back there! Very good place, overall. 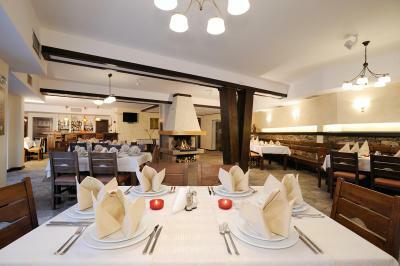 15 minutes away from Smolyan and 20 minutes away from Stoikite Ski Center. Our room was clean and warm. The restaurant in the hotel is OK. The staff is very polite and helpful. The location is a amazing, the area the hotel is located is a very nice landscape, very quiet but still close to the town of Smolyan where you can find anything you need! Smilen Hotel and Wellness This rating is a reflection of how the property compares to the industry standard when it comes to price, facilities and services available. It's based on a self-evaluation by the property. Use this rating to help choose your stay! One of our top picks in Smolyan.The Smilen Hotel located in the Rhodope mountain is the perfect place for a comfortable winter or summer holiday, a great family vacation or small private or business events. Thanks to the unique location at an altitude of 4429 feet, 3.1 mi away from the center of Smolyan and 2.2 mi away from the ski slopes of the Pamporovo ski resort, you may choose from numerous ski slopes just 10 minutes from the hotel. A relaxing massage, a visit to the sauna or the steam bath are always welcome after a day on the snowy slopes or after hiking on scenic mountain paths and before having a good time at the fireplace in the lobby bar. When would you like to stay at Smilen Hotel and Wellness? South-facing room with wooden furnishings and a private bathroom. 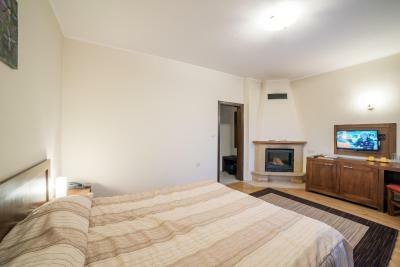 With separate living room with kitchen equipment, a bedroom, bathroom and private entrance. Spacious bright rooms with a fireplace and a seating area with sofa. Please note that the use of the fireplace is free of charge only for the first night. This studio has central heating and private bathroom. This studio has central heating, mountain view and private bathroom. House Rules Smilen Hotel and Wellness takes special requests – add in the next step! Smilen Hotel and Wellness accepts these cards and reserves the right to temporarily hold an amount prior to arrival. The linens were old and lots of spots! Hotel isn’t pet friendly! There is no free shuttle bus! Fireplace is available at additional cost! No lunch packgages as written on Booking. Awful brekfast. Most of benefits thet helped us choose this hotel are either unavailable or cost 5-10 euro per day. Parking and road to hotel covered with snow, it took them 2-3 days to clean just a bit. Restaurant is freezing cold all day long, food is at best average. They’ll give you same bread for brekfast (choose one of five options same day) and lunch and dinner and its never fresh (always dry and toasted). Towels replaced day before check out! I’d never come back again and I recommend anyone who wants at least one of things mentioned above to avoid this hotel. We wanted a room on the second floor, but without the lady on the reception desk couldn't explain to why are we placed on the first. You have a menu for the minibar but it's empty. The tea cups were not cleaned after they been user by the previous visitor. You have to pay extra for the Spa and there's a difference between what was written (6 leva) and what they told us (8 leva) on the reception desk. We were charged more for drinks cause they marked another brand of drinks...by mistake, maybe. Perfect for a weekend getaway. Close to Smolyan, Shiroka Laka, interesting places to vizit. The location was excellent, nice view ! Big rooms! Excellent stuff and hospitality! Difficult to find the hotel, but may be because we arrived late in the evening and it was dark. Clean, comfortable, quiet, great value for money!